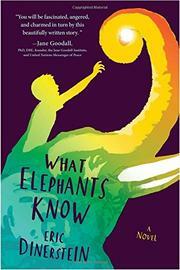 In the borderlands between Nepal and India during the 1970s, an orphan boy overcomes adversity to save his village and become a great elephant driver. Abandoned in the jungle as a baby and cared for by wild dogs known as dholes, Nandu is rescued by an elephant, Devi Kali, and the head of a royal elephant stable, Subba-sahib. That he thinks of these two as his parents is clear from the very outset of this first-person narrative: “My mother is an elephant and my father is an old man with one arm.” But one day Nandu spoils the king’s attempt to shoot a tiger, perhaps influencing the king’s decision to close the elephant stable. Subba-sahib sends Nandu to boarding school, where he is again an outsider and bullied but where he also meets a white teacher. Together they collect bird specimens for the Smithsonian. Nandu and his friend Rita devise a plan to save the village by converting the stable to an elephant breeding station. Dinerstein (Kingdom of Rarities, 2013), a conservationist who has spent time in Nepal, brings his expertise to the story, occasionally overloading it with information on Nepal’s culture, flora, and fauna. Although at times Nandu seems inordinately wise, this coming-of-age story—a story of finding one’s home—succeeds.